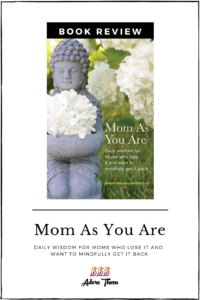 Mom As You Are: Daily wisdom for Moms who lose it and want to mindfully get it back is an important reminder to accept ourselves, as we are, in each and every moment. The good, the bad, and the ugly – we can own it all without letting it tear us down. Dawn Obeidallah Davis, PhD offers insight into a variety of important issues that we face as parents along with practical ways to mindfully work through these difficulties. You will be sure to find insight and lessons that you can apply to your own life right away! 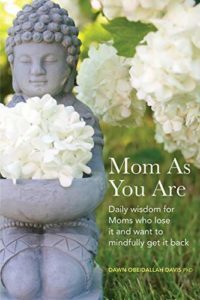 Dawn has drawn from her experience as a mom, a development psychologist, and a yoga instructor to be able to bring you a beautiful, centering book to help you savor the present. Even the title of this section stood out to me. We all have a panic button – or at least it feels that way, right? Something that triggers us to start that negative spiral, and something that seems just out of our control. But instead of leaving that panic button connected and feeling vulnerable to it, how can we take steps to disconnect those wires and move ourselves further away from the panic button. Because ultimately, we can’t stop the world around us for tripping those triggers; but we can control how we react to them. She recommends that when you are feeling this way, you take time to acknowledge that you are not the only one feeling this way. Many other people around the world are also feeling this way. And while this is sad in some sense to think of just how many people are also in a panicky feeling state right now, it is also somehow therapeutic. That thought alone can humble us, gives us perspective, and remind us that while our feelings are valid, they are not unique to us and only us. Dawn goes on to explain that what has been extremely helpful to her is inhaling deeply and imagining that she’s breathing in all the panicky feelings that millions of people are feeling. Then as she exhales, she imagines sending white, healing light to all of those who are dealing with this stress. She repeats this about 10 times and describes feeling much lighter and much calmer. This section of the book really spoke to me because it is something that I find myself struggling with on a regular basis… the urge to save things for the perfect occasion instead of just enjoying (or savoring) them as often as you’d like. I tend to fight myself internally about wearing clothes, shoes, or accessories that I love because I worry about wearing them out. I kept nice dishes away in storage for years before realizing that I would get more joy from just using them every day (even though a few would be sure to chip or even break). I even tend to save fun trips for the “perfect” day, which means that I have a whole list of day trips that we haven’t explored because I am waiting for the perfect weather, the perfect mood, and the perfect timing. But while I am waiting, I am missing out on enjoyment. Dawn speaks about consistently working towards “relaxing more with what is present.” And I like how she phrases that because we are not forcing ourselves to be present or savor the moment… we are simply going to try relaxing more and accepting what is present in that moment. Practicing regular meditation can be very helpful for this. Dawn shares that she likes to say, “smooth, slow, steady” while she inhales and exhales as a way to help focus your wandering thoughts throughout the five-minute meditation. These two sections are only a small sample of the topics addressed in the book, but they are all written in a way for you to be able to receive some helpful insight in a quick, easy way! If you want to purchase Mom As You Are, simply visit our Amazon affiliate link HERE.